In early March, I visited Munich, Germany. My sister and her two friends invited me to travel with them to Europe. This exciting trip marked my first European experience! We traveled from Tampa to London and then ended up flying over to Munich the same day. 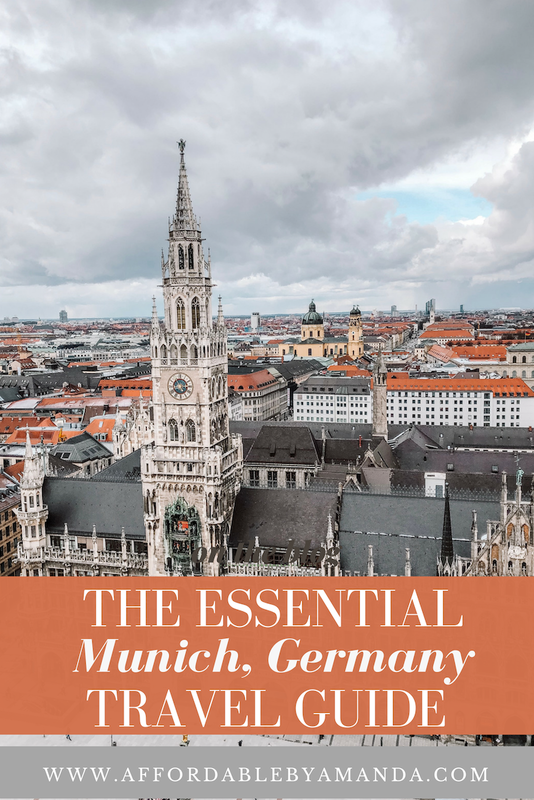 Munich, Germany is a popular destination for plenty of reasons. The city is filled with history due to the brutal nature and legacy of the Holocaust. 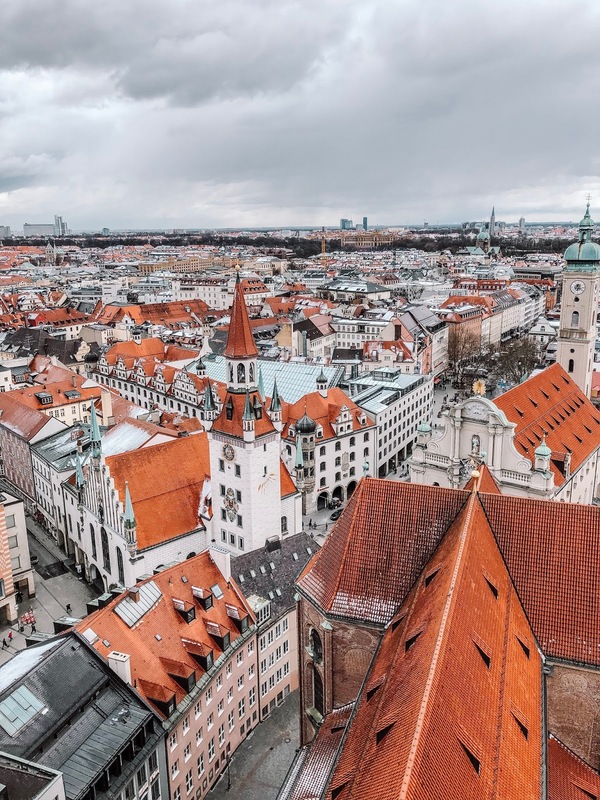 If you plan a trip to Munich, mentally prepare yourself for the intensity of the walking tours as most of them include stops along the way to discuss the rise of Hitler and the city's past during the 21st century and WWII. On the other hand, people flock to Munich to enjoy the famous Oktoberfest celebrations during the fall. From our walking tour, we learned how conservative the city of Munich is. The entire city mostly consists of Catholics and religion plays a major role with the citizens who call Munich home. It's important to be respectful and keep in mind the conservative nature felt by the people of Munich. In churches, males should remove their hats during services and even while walking around inside the church. Women are allowed to keep on their hats and while inside a Catholic church, I kept my furry hat on top of my head to keep warm. Of course, this heavily populated city speaks German. The markets will be packed with tourists which means you can get away with speaking English to the cashiers. Before the trip, I looked up a few key phrases to speak in German. I didn't want to come across as a "rude American" while traveling to Germany, so I took it upon myself to research how to say, "I'm sorry" and "Do you speak English?" Thankfully, these phrases came in handy when I was in line to pay for food at a local grocery store and could speak to the cashier in good old English! The Bavarian capital is known for hosting Oktoberfest each year. This celebration brings in millions of visitors to the area! In fact, this tradition lasts for an entire month stretching from late September into October. When do you wish to book your Munich trip? Well, this depends on if you want to explore the entire city or if you just want to enjoy the fair in the fall. 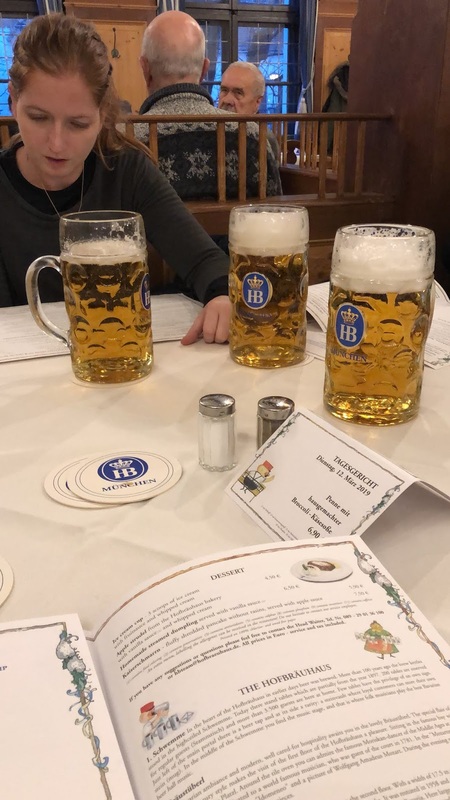 My friends and I booked our flights from London to Munich for early March because the timing coincided with spring break. Do your research before booking your flights. Our flight from London to Munich was scheduled months in advance. Flying with easyJet, it was around $66.00 and took us roughly 1 hr and 55 minutes to land in Munich. We were prepared for anything, except for snow! My winter jacket was thick enough to keep my feeling toasty throughout our long walking tour. Early March and into April will sometimes see snowfall. The snow lasted for a few hours on one of our days in the city, which quite honestly looked beautiful! If I were to plan a return trip I would schedule my plane tickets for May or June in Munich. The snow would be gone and the temperatures would feel moderate for the perfect walking conditions to explore the vast city by foot! Those months sound ideal for the best weather in my opinion. As young college-aged travelers, my sister and her friends continue to boost hostels when they visit new cities abroad. I was along for the journey and the four of us stayed in a private hostel together with a community bathroom. Our hostel in Munich was called Euro Youth Hostel. At $44.00 per night, this place is also very affordable. I would recommend this hostel to friends, too. I am not under any contract with them and these are my own opinions, just putting that out there! One of the main reasons why I enjoyed this hostel, in particular, was for its central location. It was also just a few minutes to the Hauptbahnhof U-Bahn station. As soon as we arrived, it was necessary for us to pay 5 euros for a key card to enter our room. This money would be returned to us upon leaving the hostel. We found this to be a common factor among all hostels and it was something that I noticed throughout our trip. The hostel was clean and our room gave us all plenty of space to safely contain our things while we explored during the daytime. The hostel has free Wi-Fi, an elevator, heating, a bar and dining restaurant, and separate showers for men and women. 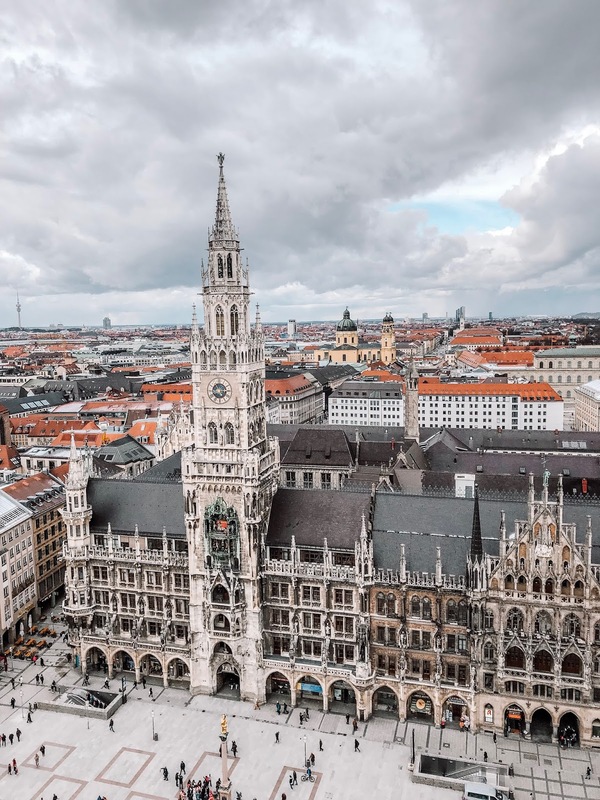 Of course, if you are planning on traveling to Munich with a significant other or with children, you may want to upgrade from a hostel and find a quaint Airbnb or hotel. These are also great options! As backpackers, we did not want to spend any extra cash on upgrades for this specific trip. Instead, we allocated those funds to eat, drink and shop. The 25Hours Hotel is an interesting hotel to mention. Inside this 4.5 star-rated hotel, you can find two unique German restaurants. You dine Bavarian style and share tapas among your friends and family. Complimentary bike tours of the city are also available. The hotel is also within walking distance to Karlsplatz You'll see a lot more sites when you travel by bike, too. Walking, walking, walking! All we did was WALK! The city is not too overwhelming which means a lot of the major buildings are close to one another. To combat the 10 miles of walking, I purchased a serious pair of hiking boots in honor of this trip. Amazon had a few options for me to consider until I chose a pair from the brand Oboz for $160. These boots were all I wore for the trip, too. If you choose to skip out on walking in the city for a bit you can always hop on the U-Bahn. This is the transit railway system for the public to use. We took a few different routes using this underground transportation system to get around the city, too. The subway is quick and reliable. Even as tourists, it was easy for us to figure out how the lines worked within the city. We also asked a few locals for advice and they were willing to provide us with assistance. When we first arrived in Munich, we stopped at our hostel to put down our bags inside our room. We toured a few churches at night because we didn't arrive in the city until 8:00 pm. It was neat to see the city at nighttime and it was also very quiet. Our hostel provided us with a few free walking tours as options the following morning. Our free walking tour would last approximately 2 hours and would take us to major buildings and churches in the area. I highly recommend taking a free walking tour in the morning! These tours are guided by locals and are available in many languages, too. We had a hilarious tour guide for our Munich walking tour who was originally from Chicago and married a German woman. Jake took us through St. Peter's Church and back to Marienplatz to see the Glockenspiel chime. Later on, the girls and I walked up the tower to overlook the Swiss Alps and the rest of the city - all 300 steps! This view looking down at the town was incredible! It also started to snow which made the experience that much more magical. It cost us 3 euros each to climb up the tower and I recommend doing it while in Munich. If you are looking for a great photo op, the tower is also breathtaking to shoot from high up above. Another area of town we walked through was Englischer (English) Garden. This huge garden was packed with people enjoying picnics under the sun. The four of us walked in and out of the garden until we found the historic Chinese Tower and stopped to watch the surfers catching waves near the flowing stream. It's a giant wave along the river that locals surf on each day. Simply stroll through the expansive garden until you get exhausted and need another beer! Beer tours are also popular in Munich. The girls and I headed out on an evening beer tour after we returned back to our hostel for a quick nap. The tour was going to last four hours, so a nap was necessary. The beer tour was also provided by the same company as our morning walking tour. The beer tour included three beers and a pretzel. Before I jump straight into discussing wonderful restaurants to grab lunch and dinner at, I have to preface my list by acknowledging the fact that you need cash to get around in Munich. Most of the restaurants and shops in the market place operate with Euros as the best form of payment. If you plan on spending ANY money on your trip I recommend converting your currency to euros before heading out of the country. Cash is king over in Europe! Be sure to have plenty of euros tucked into your wallet at all times. Fraeulein Grueneis - a kiosk within the Englischer Garden. I ate the best chicken curry there!